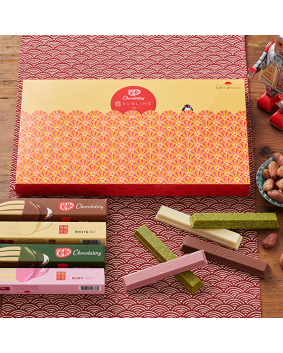 Carefully Created In Japan, discover 5individually wrapped crisp wafer fingers, covered in premium chocolate. Contains Wheat, Milk and Soy. May contain Tree Nuts. ミルク Milk / Chocolate (69%) [Sugar, Cocoa Butter, Cocoa Mass, Milk Solids, Emulsifier (Sunflower Lecithin)], Wheat Flour, Milk Solids, Vegetable Fats [Emulsifier (Soy Lecithin, Antioxidant (307b)], Sugar, Cocoa Mass, Cocoa, Cocoa Butter, Emulsifiers (Sunflower Lecithin, 476), Yeast, Raising Agents (Sodium Bicarbonate, Potassium Carbonate), Flavour. 抹茶 Matcha / White Chocolate (69%) [Cocoa Butter, Milk Solids, Sugar, Emulsifier (Sunflower Lecithin)], Green Tea Leaf (5%), Wheat Flour, Milk Solids, Vegetable Fats [Emulsifier (Soy Lecithin, Antioxidant (307b)], Sugar, Emulsifiers [Sunflower Lecithin, 476], Cocoa, Cocoa Mass, Cocoa Butter, Yeast, Raising Agents [Sodium Bicarbonate, Potassium Carbonate, Flavour. 白い White / White Chocolate (69%) [Cocoa Butter, Milk Solids, Sugar, Emulsifier (Sunflower Lecithin)] Wheat Flour, Milk Solids, Vegetable Fats [Emulsifier (Soy Lecithin, Antioxidant (307b)], Sugar, Emulsifiers (Sunflower Lecithin, 476), Cocoa, Cocoa Mass, Cocoa Butter, Yeast, Raising Agents (Sodium Bicarbonate, Potassium Carbonate), Flavour. 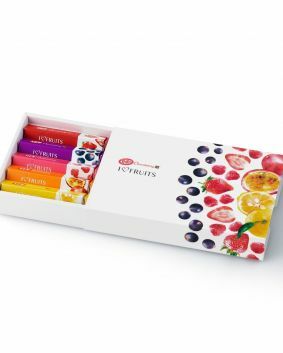 ルビーRuby / Ruby Chocolate (69%) [Sugar, Cocoa Butter, Milk Solids, Cocoa, Emulsifier (Soy Lecithin), Food Acid (Citric Acid), Flavour], Wheat Flour, Milk Solids, Vegetable Fats [Emulsifier (Soy Lecithin), Antioxidant (307b)], Sugar, Cocoa, Cocoa Mass, Cocoa Butter, Raising Agent [Sodium Bicarbonate], Yeast, Emulsifiers [Sunflower Lecithin, 476], Flavour. Products contains 69% white chocolate, 31% wafer. White chocolate contains minimum 36% cocoa solids and minimum 30% milk solids. Milk Chocolate contains minimum 38% cocoa solids and 21% milk solids. Ruby chocolate contains minimum 21% cocoa solids and 15% milk solids.